Armenians, an ancient people still living on a small part of their ancestral land, call Armenia “Hayastan,” and themselves “Hai.” Oral history explains the lineage of the Armenian people as being the direct descendants of Noah’s son Japheth. ​Indigenous to the land of Ararat, Armenians have marked their national identity with the rise of powerful Armenian kingdoms, the adoption of Christianity as Armenia’s state religion, and the creation of the Armenian alphabet, which spurred the development of literature, philosophy, and science. The Armenian language is an independent branch of the Indo-European family. It is an extremely precise language and was recommended by anthropologist Margaret Mead for use as an international language. 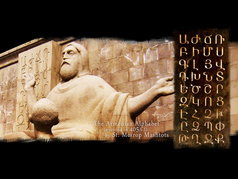 The Armenian alphabet was invented by the scribe Mesrobe Mashtots in 404 A.D., to facilitate the creation of Christian literature, primarily to translate the Bible into Armenian. It now contains 38 letters. 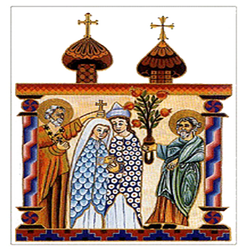 Following the religious literature, Armenian historiography flourished during the subsequent centuries and the history of Armenia was introduced to the civilized world.